Colombian troops on patrol in November. The army reported that it destroyed 1,172 encampments in 2009. (CNN) -- Colombian military forces killed 18 leftist guerrillas Friday in two operations, the National Defense Ministry said. Another 13 members of the Colombian Revolutionary Armed Forces (FARC) were captured and two more were "demobilized" in the attacks by the air force and special forces troops, which took place in a rural area of Vista Hermosa in the central department, or administrative district, of Meta. There, air force jets bombarded encampments capable of housing 200 people and belonging to Gang 43 of FARC, the ministry said in a posting on its Web site. 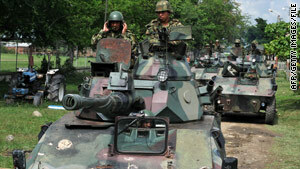 After the bombing, special forces troops surrounded the camp and began fighting with the FARC forces. They found 25 rifles, explosives and "information of interest to military intelligence," the posting said. Friday's actions are part of an offensive against FARC in Meta and the southern department of Caqueta to find those people responsible for the death of Gov. Luis Francisco Cuellar, who was kidnapped and killed December 22 in Florence, Colombia, by FARC members, the posting said. "The successes confirm that, in spite of cowardly and sporadic terrorist acts of this organization, the state continues landing serious blows and dismantling what remains of the terrorist structure," Defense Minister Gabriel Silva said. On Wednesday, the army seized 1¾ tons of cocaine in Puerto Escondido in the department of Cordoba, it said. During 2009, the Ministry of Defense reported capturing more than 200 tons of cocaine worth $5 billion. For its part, the national army reported in its annual report that during 2009 it was involved in 1,200 fights that "permitted the neutralization of 1,348 terrorist actions and the occupation and destruction of 1,172 encampments, many of which were used as laboratories to process cocaine. FARC has been at war with the Colombian government for more than 40 years. Although the government says the FARC's military force has been severely compromised in recent months, authorities still accuse it of trafficking huge quantities of cocaine to finance its insurgency. Security analysts say FARC has about 9,000 to 12,000 armed guerillas and several thousand supporters, mostly in rural areas. The guerrilla group was established in 1964 as the military wing of the Colombian Communist Party. The guerrillas operate mostly in Colombia but have carried out extortion, kidnappings and other activities in Venezuela, Panama and Ecuador, according to the Federation of American Scientists Intelligence Resource Program.